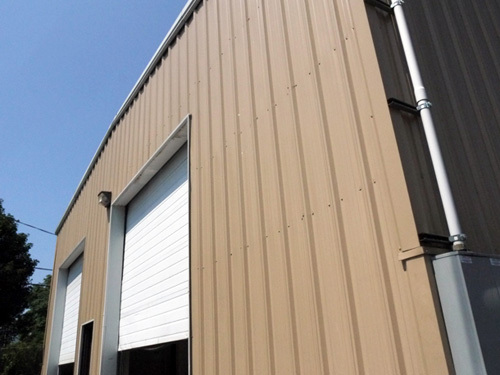 I pulled up in front of a brown metal warehouse at 9am on a Tuesday morning. It was nearly 100 degrees in Boston, and I wiped sweat from my brow as I got out of the car. White garage doors were cracked open just a few feet off the ground and I peaked under and did a quick scan for signs of booze. I didn’t have to look far. Across a sea of glass bottles and boxes, next to small wood barrels and various spirit-making equipment, Will Willis was typing away behind a laptop screen. 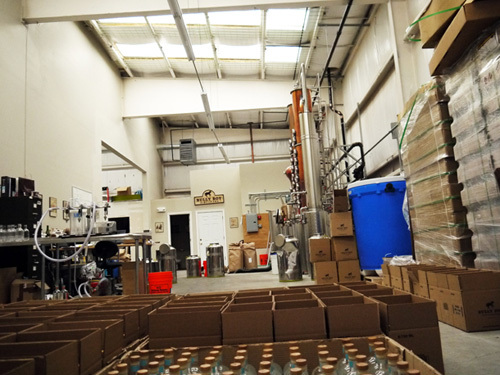 It was just a regular weekday morning at Bully Boy distillery. With a friendly smile, Will welcomed me into Bully Boy HQ and gave me a run through the operation. 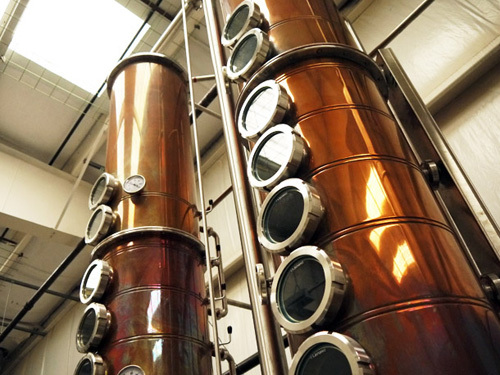 On my right, two beautiful, column stills stood gleaming up toward the ceiling as sunlight poured down and reflected off the shiny copper and glass. Behind the row of stills a mash tun was open, heating up and getting ready for the day’s work. The room was hot, very hot. Obviously central air was not an expense that could be afforded at the present. I wiped more sweat from my brow. Whoever said distilling spirits was easy obviously never tried loading massive bags of wheat into a mash tun in 100 degree weather at 9am in an unventilated warehouse in Roxbury. On the other hand, I have a feeling that there’s no place Will and Dave Willis would rather be. 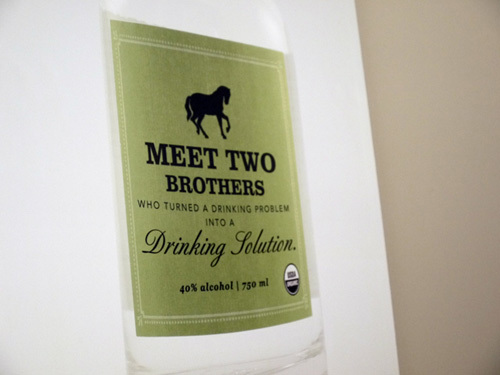 Growing up on a fourth-generation working farm outside of the Boston area, the Willis brothers have been dreaming of making their own spirits for a long time. They started with apple cider, and later moved on down the path toward fermentation; experimenting with alcoholic ciders and home distillation. At one point they even considered opening a distillery at their parents farm in Sherborn, Massachusetts but pops said no way. Didn’t want drunk tourists hanging out in the backyard. On their path toward opening the distillery, the two brothers spent some time out in Missouri making inroads and learning from an industry veteran who specialized in rum and whiskey. 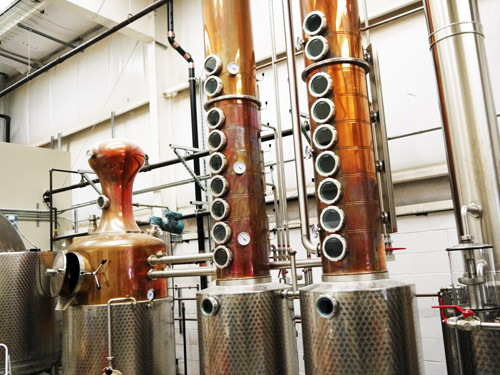 They purchased their equipment from a distiller out in Chicago and worked with him for a little while as well to get a feel for the stills. As Will pointed out, every still is its own beast and going from a two-gallon stovetop still to a 150 gallon commercial still is an awfully big leap. If you can get some hands on training, take it. Bully Boy is now in their second year of business. 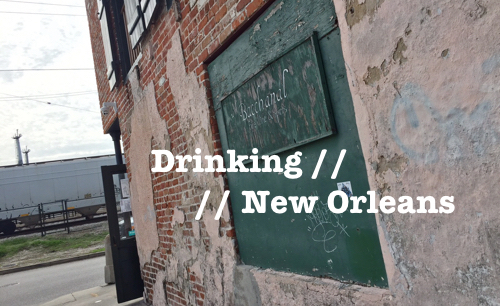 They churn out distilled spirit by the gallon – whiskey, rum and vodka. 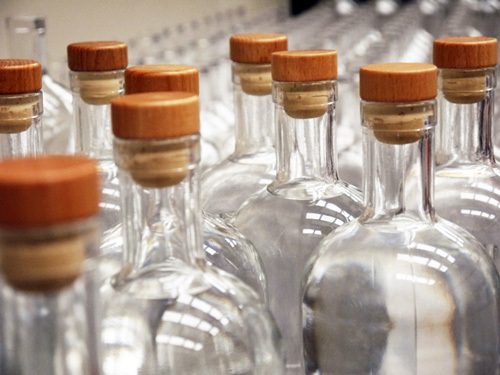 Their current releases include an organic wheat-based vodka, white whiskey and white rum, and they are in the process of gearing up for the launch of two barrel-aged spirits which have been mellowing in oak barrels at their Roxbury warehouse. Dave Willis hinted at a possible fall release of their unfiltered whiskey – a 100% wheat-based spirit aged in new American oak barrels. Also, judging from the intensely sweet vanilla aroma coming from the rum barrels, I’d imagine that the aged rum release isn’t too far behind either. If you ask the Willis brothers what they’d like to hang their hat on, you’ll get two different answers. Will’s passion is rum. Dave’s is American whiskey. But you also get a feeling from talking to these two stand-up guys that they love what they do and that no matter what spirit they’re producing, they’re having fun and living out a dream. It’s also clear that the brothers take this business extremely seriously. 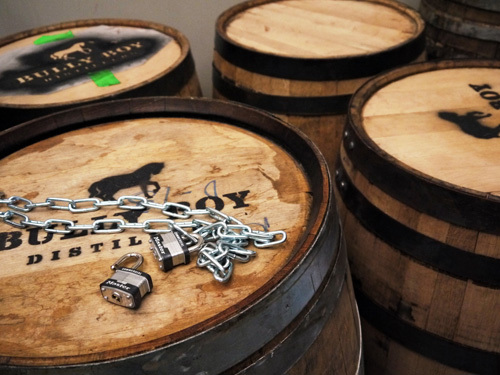 Every batch of spirit is tasted and perfected to the high standards that Bully Boy has set out to achieve. The response from the public has been nothing but positive. 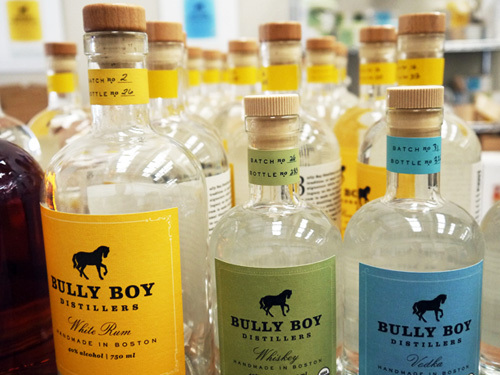 From hot and trendy bars, to the shelves of top spirt retailers and at-home drinkers, Bully Boy has no question made a dent in the New England spirits market. 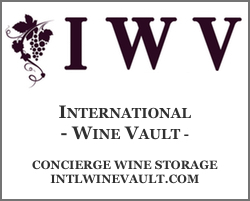 They’ve garnered a ton of press, have won over numerous top bartenders in Boston and have even made inroads into the travel and hospitality segment. In fact, the day I visited, they were in the process of training someone on helping out with tours. A sure sign that the small family company is taking off. 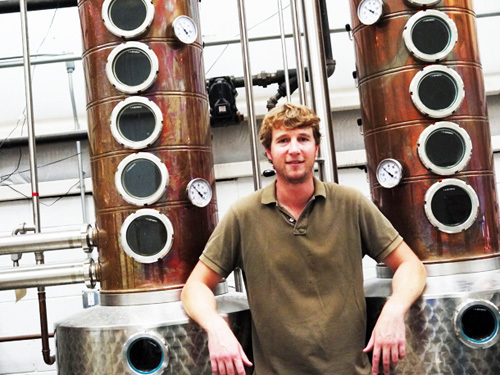 These are exciting times for craft distillation in America. 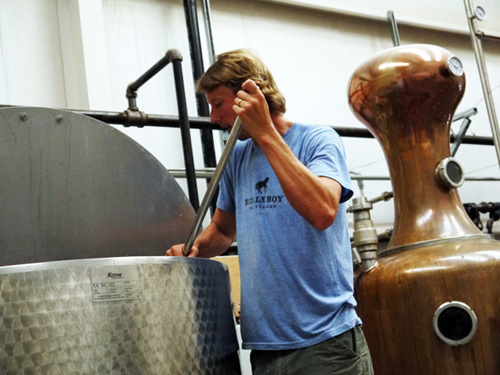 From the “seasoned” vets like Berkshire Mountain Distillers and High West to the blazing hot upstarts like Bully Boy, this country is just at the tip of what this craft spirits industry will become. And for the Willis brothers, I’m sure amazing things are ahead. They’ve got a great product, a brand that’s taking off and a community that’s supporting them. A big thanks to Dave and Will for showing me around. I eagerly await the release of their aged whiskey and I hope that it’s bottled at 90 proof (hint hint). 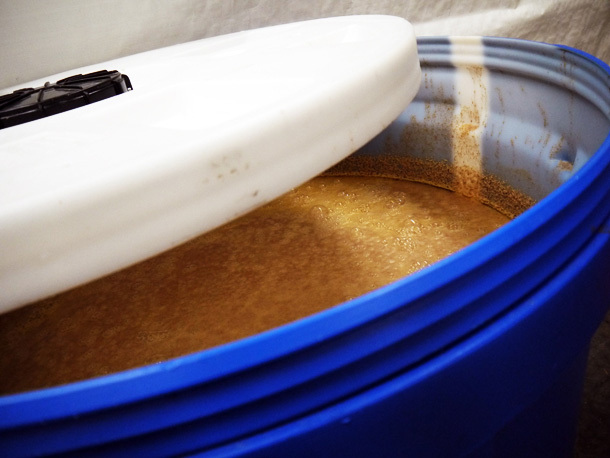 Making the Mash: The first step of the process is mashing together the wheat and water. Here, Will stirs the mixture along with organic enzymes which break down the wheat into starch, and later starch into sugar. Once the mash is taken out of the mash tun, the liquid is drained into large blue tanks where the mash continues to ferment for about a week. 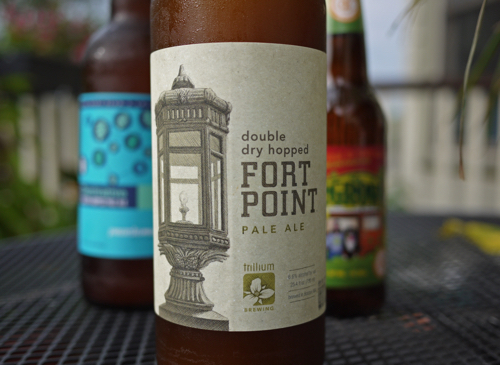 Extreme cold or heat can kill off the yeast, so the brother’s keep a steady eye on the mash – especially during hot summer months and during late fall and spring where outside temperature can fluctuate quickly. Bully Boy’s custom 3-still set-up gives the brother’s the best of both worlds. The mash first enters the pot still (featured on left with the dome cap), which sends distillate into the column stills where the vapor rises through plates (represented by the circular windows). Cooling water is them pumped into the column stills to keep vapor temperatures at bay. As vapor starts reaching desired temps, it continues into the condensor (on far right) which cools the vapor back into liquid. Distilled liquid comes out of the stills in three parts: heads, hearts and tails. The hearts (ethanol) is the good stuff. Heads and tails contain low boiling point and high boiling point compounds which are undesirable in any significant quantity. 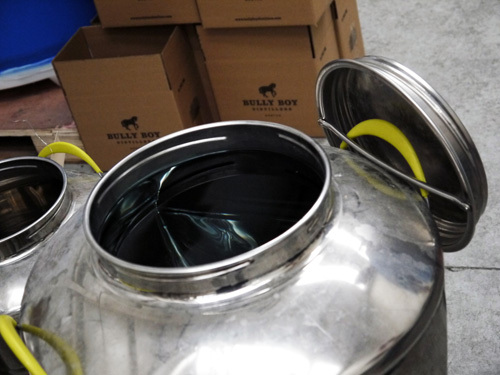 Bully Boy uses these metal buckets to collect the heads and tails, which together are called faints. 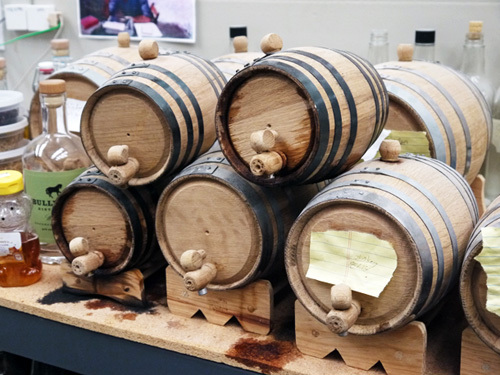 The brothers use a stable of mini wood casks to test aging effects of wood on their spirits. 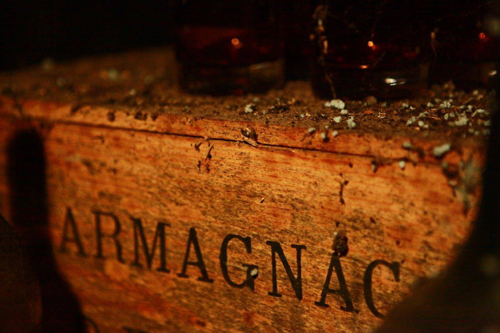 Smaller casks speed up the aging effects of wood on alcohol.